It’s unusual to actually chill chocolate in the fridge and it’s something I am always telling people to *not do* but in this case Hotel Chocoat have specifically formulated these chocolates to be put in the fridge and eaten cold. 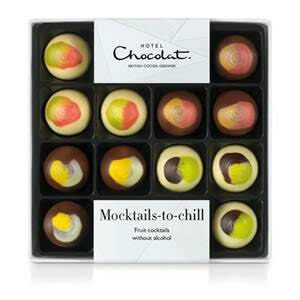 Mocktails to Chill – £10 – Refreshingly fruity mocktail chocolates with tangy real fruit flavours. Inside, you’ll find 16 chocolates in four different recipes: Spiced Pineapple Punch, Peach Iced Tea, Virgin Mojito and Wild Strawberry Daiquiri. 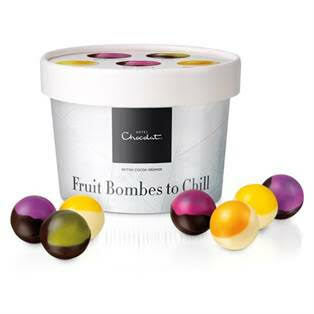 Our mocktail chocolates make delicious party pieces at room temperature, but they’re even better if you play it cool. Just chill them for 30 minutes and serve up a unique summertime chocolate treat! Wanna go large? There is the Sleekster for £22 which I am giving away 2 of! 38 exquisitely fruity and tangy truffles all in a single box and these are the ones I AM GIVING AWAY! 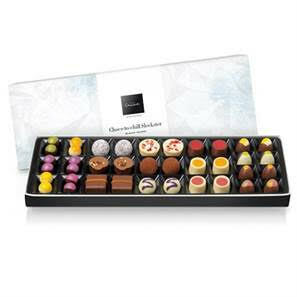 Thanks so much to Hotel Chocolat I am giving away TWO BOXES of these chocolates – one each to two winners! So you have 2 chances to win and I’ve made sure to give lots of options to win. I feel that it is easy to leave a blog comment so that this the required entry. After that the other bits are optional but increase the number of entries you have in the competition. So I have TWO prizes and so TWO different people could win! Your comment must be a minimum of 10 words and should describe your favourite Hotel Chocolat chocolate such as their single origin bars, chocolate covered nuts or champer truffles or something else. It has to be over 10 words and has to be about a Hotel Chocolat product. After that additional entries are for following me and/or Hotel Chocolat on Twitter, tweeting the special tweet exactly with no edits, visiting the Mostly About Chocolate Facebook page and other bits. There are always rules of course. This is being run through Rafflecopter and the Tweets are additionally being tracked through a hashtag tracker. 1.The competition will finish on Saturday 15th August 2015 as per Rafflecopter widget. 2.The selection of the winner will be selected by Rafflecopter and verified by hand to ensure entry complies with the rules. 6.Your details won’t be passed onto anyone else except your address to Hotel Chocolat so they can send you the chocolates and will not be kept in any way. My favourite Hotel Chocolate is the Eton Mess Slab. It is a Thick slab of Strawberry & Vanilla Chocolate With Meringue & Biscuit pieces. It’s creamy & Crunchy at the same time. At the moment I am loving Hotel Chocolat’s Supermilk selector slabs – creamy milk chocolate with an intense taste. the Rocky Road Giant 500g Slab is my favourite; it`s large and delicious but wouldnt last long with me! WE always buy the extra thick eggs for Easter i love the truffles you get inside. expensive but yummy! Classic Champagne Truffles are my favorite as the flavour is devine! I love their caramel chocolate, particularly the Caramel and Co mini slabs. My absolute fave are the egglets they do at Easter! Florentine Isabelle – That was definitely my favourite out of the one’s left over that my wife didn’t eat from an H box! So I didn’t have many to choose from…. The H-Box Dark Selection looks so mouth watering, especially the Pistachio Praline and the Champagne Truffle. I love the Mocktails to Chill, particularly the Spiced Pineapple Punch, as they are so smooth and fruity. I love the Rocky Road Giant slab as it’s very decadent & moreish. I’m planning to buy one as a housewarming present for my brother who’s first house is on Rocky Road in Belfast! They made these chocolate shortbread cookies which I can’t find on their website anymore. I got them as a birthday gift last year. They were amazing. I want one right now. I’m sad I’m not having one right now. I came to this competition to be happy but now I’m sad I don’t have this cookie. Also, pretty much every Rabot dark chocolate bar they do. I’m especially fond of whoever writes the copy for the bars. I love the Billionaire’s Shortbread because it has everything: Smooth chocolate, creamy filling and a delicious shortbread crunch on the top. Supermilk Hazelnut Slab Selector, the smoothness of the chocolate is a whole new chocolate experience for my mouth! The smoothness and creaminess is one I’ve never experienced before and with the hazelnut texture it’s just the perfect combo and perfectly moreish! I’m a big fan of their Selector chocolates, my favourite is the Blackcurrant Selector. Way not enough blackcurrant and chocolate combinations out there. I love the white chocolate and mint slabs. It is unusual to see mint with white chocolate. They are a great alternative to original after dinner mints. They are also not too sweet. I buy them when I go to the Hotel Chocolat shop in the Metro Centre. Salted caramel chocolate is by far the best combination of chocolate yum yum!!! The Salted caramel chocolates just melt in my mouth as I lick my lips. I’m a sucker for Hotel Chocolat salted caramels. They do so many other delicious chocolates, but that would always be my first choice. Winning chocolates from you seems to the the only way I manage to get any these days, so crossing fingers. *hahaha* I wonder if you have a deal with Rafflecopter or something 😉 But I wish you luck! I love chocolate covered nuts becuase they are nutty like me! Would love to win this. Love Hotel Chocolate, especially their Rocky Road to Caramel Extra Thick Easter Egg. Thats the one that I wait all year for! My favourite products are the Mojito Selectors! They are filled with so much flavour it’s unreal! PErfect for a night in alone or a night with the girls! I can’t see on the website now but I once had some Chilli Chocolate Puddles. They were lovely. Not too hot but very warming in winter. My favourite Hotel Chocolate is the champagne truffles they are a real treat. My favourite is the Salted Caramel & Pecan Chocolate Spread. Very dreamy! It is good on toast but I actually love it with dates! I treated myself to one of the Extra Thick Eggs a couple of years ago, it wazs fantastic and felt like it lasted me ages. I’ve had a couple of the ostrich eggs, they are just divine so indulgent, The chocolate on the egg is super thick and has a great crunch to the bite..
Hotel Chocolat Gemstones – serve these tiny shiny pearls of dark and white chocolate with coffee and you will make friends forever. Confection perfection. My favourites are gin puddles – they taste divine and are my special treat. these chocolates look yummy, would love to try them all. My favourite Hotel Chocolat chocolate is their scrumptious Rum Truffles. I just adore the flavours and the brilliant combination/ratio of rum to chocolate – They were very generous. Also the chocolate is so rich and creamy. I’m a fan of the Hotel Chocolate Salted Caramel Slab – divine deliciousness! My favourite chocolates are their Pink Champagne Truffles – they are absolutely gorgeous and once you start eating them it is very hard to put them down. We love the new shop that has opened up in Cardiff and also our other favourite is their Little Fancies. Brilliant competition 🙂 Thank you ever so much. I love the Hotel Chocolat slabs. My favourite is probably the Rocky Road. Salted caramel chocolate – caramel, salt & chocolate combination. What’s not to like? Difficult to pick just one but I do adore the Florentine Isabelle. The roasted almonds, caramel and milk chocolate are such a wonderful combo. I love their Rocky Road Giant 500g Slab. Packed full of all sorts of treats. I love them all but my favourite is the salted dark soft caramel which is so good I cannot think of anything else now! Ooh my favourites are the Chocolate Brownies! I got completely addicted to them when they were Taste of the Month a few months ago – found myself unable to walk past Hotel Chocolat without ending up inside by the brownies! They are so lovely and velvety but with the crunch and added texture of the nuts. And a lovely flavour – just divine. I always go for the slabs – all of them are delicious so it doesn’t matter which one!! My absolute favourite chocolate from hotel chocolates is the Caramel Cappucino Slab, I’m a huge coffee fan! What a great giveaway, how I do love Hotel Chocolat, my favourites would have to be the slabs there’s a beautiful vanilla white chocolate and raspberry one that I tend to treat myself to. I’m completely in love with the Salted Caramel Milk Chocolate Puddles. But then, I love just about ALL their chocolates! Hotel Chocolat Salted Caramel Drinking Chocolate feels very decadent and tastes just delicious, the layers of sweet and salty and I want to say malty…….perfection in a mug. Mousse au Chocolat, yummy, melt in the mouth, little balls of deliciousness. I absolutely ADORE Hotel Chocolat’s Gianduja bombes – the smoothest hazelnut praline you can imagine, and even better, made with dark chocolate! Eton Mess Selector – I like mousse, white chocolate and meringue. What is there not to like when you have these different things together! I’d be happy to live on nothing but champagne truffles…. unhealthy…. but happy!